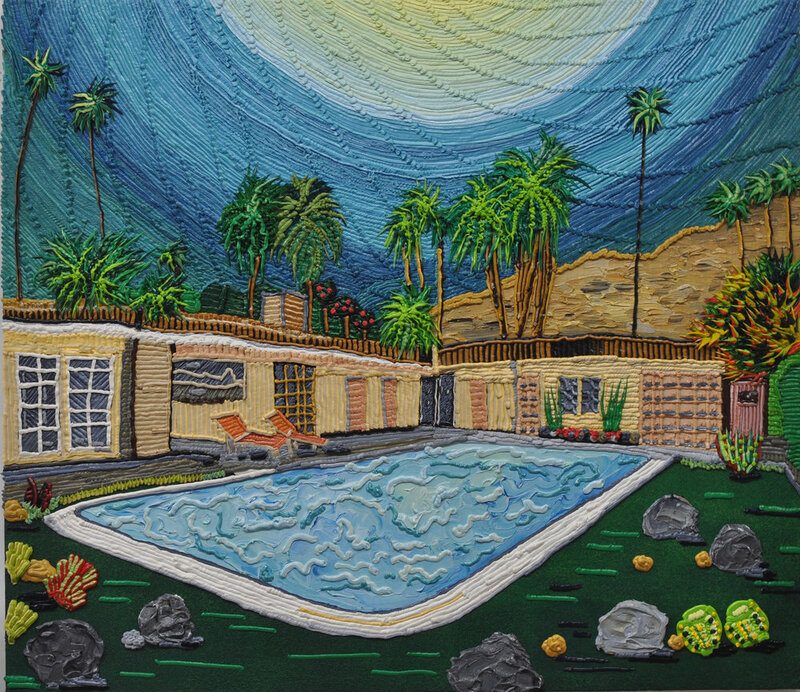 Caroline Larsen’s paintings are enticingly decadent and visually lush. Larsen marries her painted scenes of floral arrangements and still lifes, mountains, and suburban Californian pools with her distinctive method of piping out oil paint. The result is a sculptural relief where texture, color, and imagery merge together to create abstract figurations of still life and landscape scenes. Mark making is central to the work, and Larsen plays with ways of weaving, outlining, and filling colors together within the pictoral plane. Colors are blocked together, ombréed, layered, and braided, creating fields of vivid forms that fade in and out of recognition, heightening a tension between figurative reality and abstract fantasy. The density of the work, the sheer amount of paint and physical visible material, acts dynamically in relation to the saturated colors and natural imagery, creating an activity that lies within the painted surface and instilling optical ripples and effects that threaten to almost break through the painting surface. Individual strokes, lines, and dots pixelate images into frosted renderings of reality. Vivid patterns and colors operate as a way of exciting the eye and organizing the image, rather than instructing the viewer in a direct read of the work. 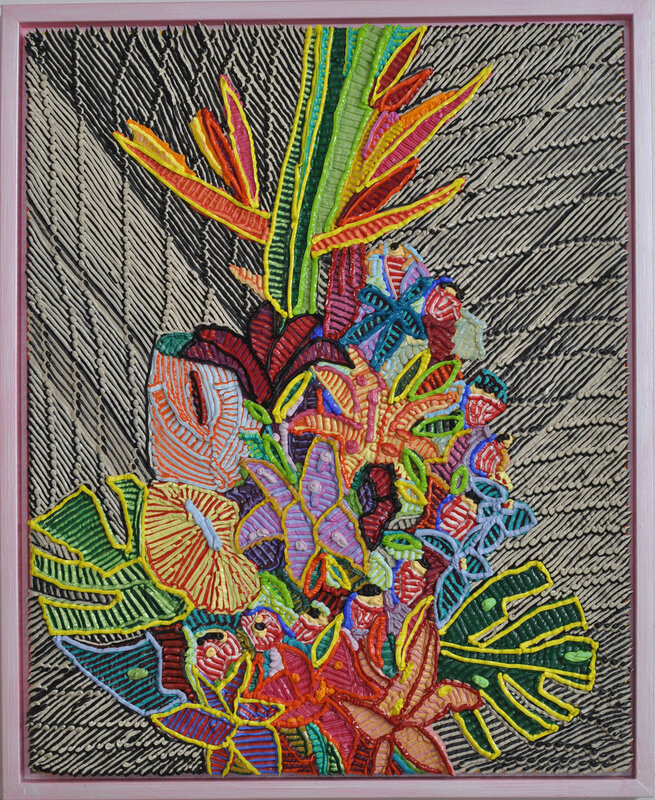 In her recent body of floral works, arrangements of flowers, succulents, and fruits are arranged in elaborate, towering cascades against a woven, ombrée background. In her piece Acid Flowers, Larsen combines yellow and dark teal paint into a single bag, piping out angled lines across the board, creating a vortex of blended color. The title is apt for this piece -- the resulting color blend is acidic and jarring. Yet at the same time it is also calming, undulating in the way the colors recombine and merge together. This trippy background obscures the subject of the work. The flowering form that emerges like a figure stretching upward across the image plane is dissociated from any environment. It exists in a psychedelic other world, and the colors and forms of the leaves, petals, and branches fade in and out of confronting the yellow/blue acidic waves that background it. The floral tower itself becomes abstracted as well. The identifiable forms, leaves, and botanic shapes break down into individually piped lines, colors, and dots. Each flower buds into the next, creating a puzzle of distinguishing shape, form, and color. Larsen’s works become psychedelic operations of discovery and reconfigurations of reality. Caroline Larsen was born in Canada earned a BA with Honors in Fine Arts at the University of Waterloo, Ontario, a Graduate Diploma in Visual Arts and Art History Education from the University of Auckland, New Zealand, and a MFA with Honors from Pratt Institute, Brooklyn, NY. Her work has been included in solo and group exhibitions across the United States and internationally in Canada, Tel Aviv, Berlin, and Mykonos. This past year, she had solo exhibitions at Craig Krull Gallery (Santa Monica), Fresh Paint (Tel Aviv), and Spring / Break Art Show (New York) alongside various group shows including Greenpoint Terminal Gallery (New York), Dio Horia (Mykonos, Greece), and Dean Collection (Berlin, Germany). She currently lives and works in Brooklyn, NY. Let’s start by talking about your background in art and how you arrived at this way of mark-making. How have you developed into your current body of work? I started off studying ceramics at Alfred University, which has a very strong ceramics program. I remember during my first year foundation program going downstairs to where the older students kept their work and seeing a bunch of sculptures. One of the pieces was this massive wedding cake that someone had made out of clay and then decorated using a piping bag filled with slip. I later left Alfred and concentrated more on painting, but that cake has always stayed with me and I still remember seeing it. I left Alfred and went to the University of Waterloo in Ontario to study painting, and during my first year there we were given an assignment to make a really thick painting. I had just gotten my wisdom teeth removed at the time, and it was a very intense surgery where I was given a selection of small syringes to help clean out the sockets in my gums. It was pretty awful, but when we got the assignment I had all these syringes -- these small squeezy things that extruded other things -- so I decided to use them to squeeze out paint...and then I actually got really into it. I got super into it, and this painting kind of informed the rest of my art making. When I started making the woven paintings about six or seven years ago, I actually went and dug this first piece out of my parents’ basement just to make sure it hadn’t fallen apart, and it totally held up. That’s how I got interested in the whole idea of squeezing paint, and then I just started translating that into other paintings that I was making. After I finished undergrad, I did a lot of different things and with painting I was doing more traditional brush paintings, but I was always still highlighting everything with paint piped from a bag. For example, I had a bunch of paintings of Niagara Falls and certain parts of the painting would be executed with squeezed paints, like a rainbow or something. So all of my paintings had these little elements of the squeeze, and then I just decided to go all in and make one made entirely out of squeezed paint. I watched all these YouTube videos about how to weave the paint -- it’s called the basket-weave technique. I started off really small making abstract paintings, and then it evolved from there. I was playing a lot of tennis at the time. With tennis, there’s the sky, a cloud, then a line of trees, and then the court, so the imagery is like a pixelated video game almost and it was really easy for me to look at that and translate it into a woven painting. When I started making those works, I only used about seven colors. Now I use a lot more bags of colors. I also started doing paintings of suburban houses. Across the street from where my parents lived used to be a horse farm, but then it got turned into a development of hundreds of houses. So those were some other paintings I did when I first started developing this woven technique that was expressing things that weren’t abstract. I was interested in the weave not so much because it was a weave, but more so because it read to me like a pixel. I always work from photos instead of my mind, and there is then always this disconnect between the flat photo and the real life object, so when I think about something that has shape and form and making it into a flat painting, I always just try to look at a photo because it is already flat and then I translate it from there. 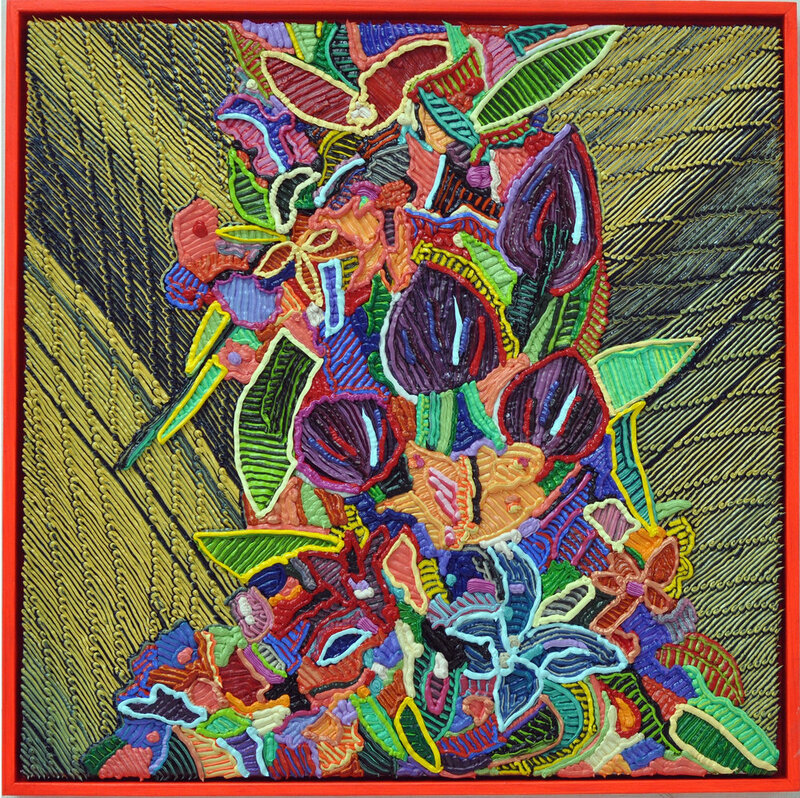 The more I got into the woven paintings, the more I got interested in their relationship to craft. 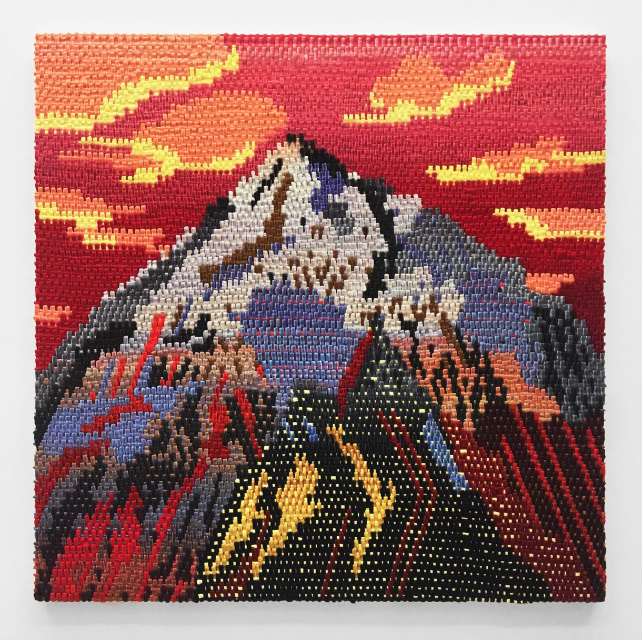 I did a series of mountain paintings that had borders around them, where I was kind of referencing quilting because when the mountain paintings are working for me, they start to look almost like a blanket or something that’s crawling in front of you in my mind. Can you talk about your process making these? In terms of your mark-making, I notice that there’s a lot of different types of strokes that you’re making, especially thinking about mapping out the different sections of the work and the marks that are married to them. 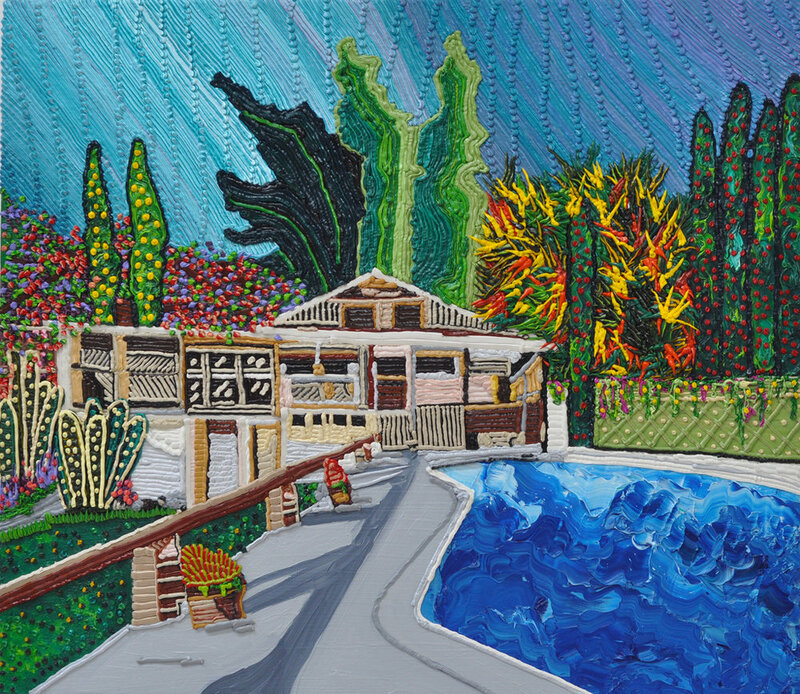 I have this other body of work that focuses on suburban houses and pools, and with those paintings I specifically tried to match the mark-making to the object. If it’s water, I try to make it look as watery as possible by either scraping the paint or using a pallet knife to swirl the paint and try to give it an iridescent movement like water. Or with trees or leaves or bark -- I try to replicate that thing in a painterly way, not sculpting with the paint, but mark-making with it. These new floral ones have a sponge and stencil brush background. I got interested in that mark because when I was in grad school I remember somebody talking about the worst or cheesiest kind of painting, and they were like, well obviously sponge painting is the worst. But I actually got excited by the idea of the sponge! I get these stencil brushes from Target that have really stiff bristles -- I use them also for painting sand -- and they’re super durable. I don’t use any paint thinners, so when the paintings get crusty I can just put more paint on top. Those paintings have this weird, spongey background because I’m looking at old Dutch Baroque paintings as the inspiration. My other flower paintings have this ombre loop-de-loop background, that’s almost ribbed or something and that started pretty organically. When I was starting to make more pool paintings, I was thinking about how so much of the painting is the sky, but I wanted to address that sky in a more interesting and active way. That was a jumping off point for thinking about the mark. The flower paintings also used to have so much information in them. Instead of the ombre background, there would be leaves and different colors. So it started as thinking about a new way to make a background and went from there. My favorite ombre is the black and white together. For this new one, I’m going to make this scalloped background. I’m really into art deco, so I’m going to make a scallop background where each of the scallop shells is going to be looped. I want them to be a bit psychedelic. I’m happy with these paintings, but I always reach a point where it starts to become too boring for me, and that’s when I start developing the next thing to make them more dynamic. Where are you getting the imagery from? I google flower arrangements, and I’ll just spend hours looking at imagery for that in Google image searches. Before you know I’ll have hundreds of flower bouquet images that I’ll then put in a folder and sort through, selecting the ones that I like best. From there I’ll draw it out, and then I get rid of the photo after that. I feel like if I keep the photo, I’ll just replicate it by looking at the picture, so as soon as I do the drawing then the photo is gone. How has your subject matter developed? I know you initially were making paintings of ships and cars on fire -- how did you develop from there into the mountain paintings, pool and suburban house paintings, and the floral imagery? There seems to be a balance between figurative scenes and figurative abstractions. The car paintings are really old, they’re from around 2011. The first big body of work that I made with the woven technique was container ships on fire or sinking. My parents moved to Panama, so we would be out fishing and see container ships go by, and they are so huge -- they’re like the size of a shopping mall. I was overwhelmed, and I also discovered that when they sink, they’re just left in the ocean. So I was making these paintings of container ships and boats on fire, and then I moved to cars on fire because I got more interested in how the smoke and flames were abstracting the image. After those paintings I moved on to the mountain works. I was living in Toronto at the time and I went out to Alberta to where the Rocky Mountains are and that’s where I got interested in the mountain imagery. The way the sun hits the mountain and the snow caused these crazy and beautiful gradations of color. With this kind of painting, when I squeeze the paints through the bag, I can achieve a really nice gradation. I can fade or gradiate the paint with just one bag that I’m feeding paint through. I don’t like to work large, but with the mountain paintings it just worked having them larger, so also all of a sudden I was making larger scales of works. I painted mountain paintings for like a year and a half and then I moved to New York for graduate school. At the time, I was feeling like I was getting really stuck in woven painting because it’s the same mark over and over again, and I was trying to figure out how to translate this woven technique into a different body of work. That’s when I started getting really interested in cactuses and flowers, suburban homes, and swimming pools. I would go down to Los Angeles often to visit my best friend who lives there, and it’s just a totally different landscape that I was seeing out there. Also being in grad school, I was just in this mindset of feeling like I was going to be poor forever, so I would daydream about how nice it would be to own a home, and that’s kind of how I came up with those house paintings. The houses are really beautiful and have great gardens, and I’m not going to say that they’re aspirational paintings, but in a weird way I was pushing forward this idea of what it means to be successful and it bore out of this new lifestyle change of being a student. But as I was researching images of homes, I would also come across pictures of indoor succulent gardens and I started looking at those kinds of images, so that then entered into my work as subject matter. I was working on these paintings in graduate school, but I feel like I can only make about ten paintings before I need to figure out a way to reinvigorate the works. I remember hearing a talk at the Jewish Museum about abstraction, and I was taking a class called Looking at Paintings at the Met, and so I was thinking about these things and hearing people talk and I just realized that because I’m making the same mark over and over, I really need to have these paintings be all over -- everything, the subject matter, the marks, the imagery, had to really be all over the work. So with that in mind, I started out with a small painting that was of these bird of paradise flowers shooting up and out like a bouquet, and then I filled the rest of it in with leaves jutting out and flowers, and snake squiggles, and I was really having things very filled in and jutting in and out. It was from there that I then decided to isolate the inside of the paintings and have a background ombre fade around the subject. In a way, I kind of think of some of them as portraits in terms of how they’re framed. The current body of still-life paintings came from my previous work, but I was also asked to be in a show called Still Life, so then I decided to go pretty heavy into incorporating still-life imagery like skulls and shells into the works. Abstraction is present in the work, and it’s interesting because it the work is still very obviously representational. How do you approach thinking about that balance? Abstraction is really important in my work, but I always want to make sure that I’m abstracting something. I don’t ever start out with the idea that I’m making something “abstract”. I know that if I’m going to paint something floral, the inside of the painting is going to be more interesting if it is more ambiguous about the forms and shapes. I don’t make them anymore, but the car fire paintings I did were the most successful when you were a little confused by them and didn’t quite know what they were or what you were looking at. It’s kind of like a magic eye -- you have to figure out what you’re looking at, but then you can never unsee it. But I like abstraction and I like the idea of them existing in between both realms. How are you thinking about color with these works? Sometimes I’ll decide that a painting is going to be more turquoise or more heavily red, but that’s about it. I always have all of my colors out and all my paint bags -- all my paint is in bags and they last for months, so the more and more bags I have, the easier it is to start the painting with every color I have. Sometimes I have them a little planned out, where I know groupings of colors that I want in various sections. But I’m always just trying to play with color and making different colors vibrate together and create different color relationships. How are you approaching these new still-life pieces? I’m really into the still-life paintings, which surprised me. I started making them initially for this particular show. I started them by thinking about what I considered still-life-y, so I thought of skulls and shells, and I was looking at old Dutch still-life paintings and also paint-by-numbers paintings. I’ve also been wanting to incorporate more varied textures and degrees of flatness and thickness in my works, so I’ve been playing around with that in these as well. A lot of times with these paintings I don’t know if they’re going to work until the very, final end. I didn’t really know if the sponged background was working until I finished one, but I actually like it and it’s cheesiness, it reminds me of those black light velvet paintings from the 70s. How are you incorporating flatness into the works, and how do you think about texture? I want to develop the texture more because the thick paint can be used to emphasize the thin, and then the thin areas can re-emphasize the thick parts of the work, and I find that relationship really interesting. It creates different levels and heights of relief. What are your new pool paintings going to be like? 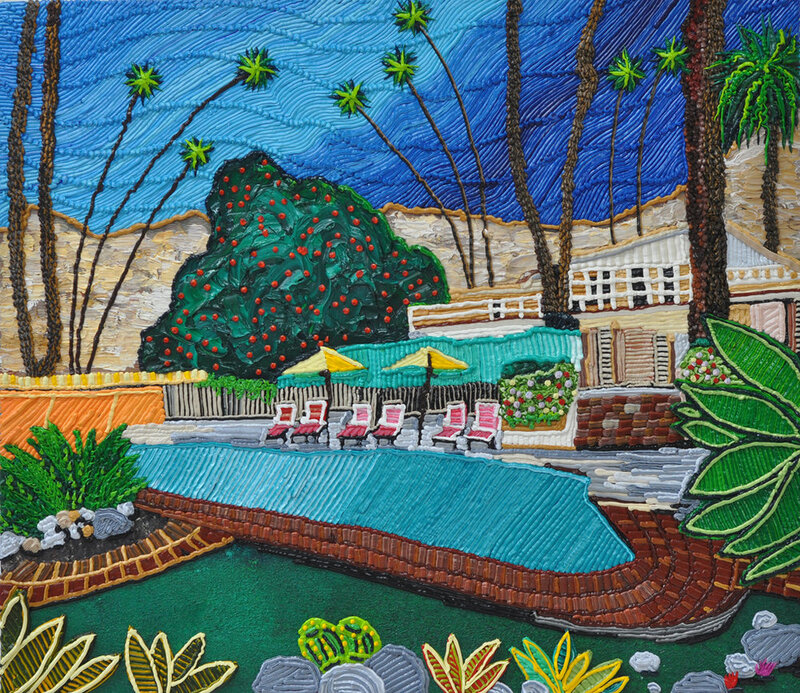 There are going to be a lot of circular pools or kidney shaped pools...I also found this awesome image of a pool in Palm Springs, but all the buildings around it are different colors. I’m also doing pool paintings at dusk, so I’m playing around with the light a bit more. Do you usually work on more than one piece at once? Yes, but that’s actually been more of a recent thing. I used to work on a painting start to finish, but now a lot of them just have so many steps that there needs to be drying time, so I now work on a few at once. I’ll also just lose interest with things too, like I’ll be super into mountain paintings, and then all of a sudden I can’t even look at them so then I’ll shift and get really into still-life or flower paintings...and then all of a sudden I’ll get bored again. It’s a cycle that I go through. What’s influencing your work right now? I’ve always looked at Baroque paintings or floral still-lifes, but sometimes I’ll be really into an idea or types of imagery and just not know how to translate it into my work. So right now I’m looking at a lot of still-lifes and even still-lifes that are a bit more like printmaking, where there are a lot more solid areas in the picture plane. So I’m looking at that, I’m looking at flowers and bouquets, and then I’m also looking at what’s happening around me and seeing shows in Chelsea and the Lower East Side. Are there images or imagery that you think about a lot or have thought about making into a painting but haven’t yet? I think a lot about art deco or art deco imagery and shapes, and that’s something that I’m trying to translate into the work so that the painting can read as art deco inspired. And I think that also kind of references back to my California fetish because art deco is everywhere there. I’m also thinking about playing with the thickness of the paint, and I’m really interested in making paintings that are really psychedelic. I’ve also always wanted to paint something plaid, which I’ve never actually done...maybe a painting that has a tartan background, but I also don’t know how to translate that into the paint and not make it too cheesy.